Herbicide resistance is not new to Wisconsin, but is spreading. Common waterhemp (Amaranthus rudis) has become an increasing concern in Wisconsin in recent years. A close relative to redroot pigweed (Amaranthus retroflexus) and Powell amaranth (Amaranthus powellii), common waterhemp is infamous for its abundant seed production and propensity for developing herbicide resistance (Bradley 2013), which are two things growers do not want happening in their fields. Herbicide-resistant common waterhemp was first confirmed in Wisconsin in 1999, when a population was found to be resistant to acetolactate synthase (ALS)-inhibitors (Heap 2016). More recently, glyphosate-resistant waterhemp was found in Pierce and Eau Claire counties (Butts and Davis 2015). Since that time, efforts have been made to monitor the spread of waterhemp in the state, especially those populations that may be resistant to glyphosate and other herbicide sites of action (SOA). Nationally, waterhemp management has become increasingly challenging as this species has developed resistance to six unique SOAs, with 18 states reporting resistance to at least one herbicide SOA (Heap 2016). Six of those states also have waterhemp cases of multiple herbicide resistance of up to four different SOAs. Dose-response experiments were conducted to determine glyphosate resistance. Responding to widespread concern of possible glyphosate-resistant waterhemp in 2014 and 2015, we collected seed heads from several mature female plants that had survived exposure to glyphosate in the field. Six populations were sampled from Chippewa, Outagamie, Sheboygan, and Waupaca counties in 2014, and five populations were sampled from Crawford, Lafayette, and Walworth counties in 2015. Once dried and threshed, seeds were stratified (cold treated) for 6 weeks, planted, and grown in the greenhouse for whole-plant herbicide dose-response experiments. Five to 10 plants per population were treated at each of eight rates of glyphosate ranging from 0 to 12.4 lb ae acre-1 (up to 16x the labelled rate) plus 17 lb ammonium sulfate 100 gal-1 water. Each suspected resistant population was tested in two screenings to determine resistance. Shoot dry biomass was collected 28 days after glyphosate application, dried, and weighed. Comparisons between a known susceptible population and suspected resistant populations were made based on the predicted dose required to reduce shoot biomass by 50% (ED50) compared to non-treated plants (Knezevic et al. 2007). Some populations were also tested for resistance at the University of Illinois Plant Clinic using a molecular screening methodology for specific genetic markers (Bell et al. 2013). Since 2013, herbicide-resistant waterhemp populations have been found in 16 Wisconsin counties. 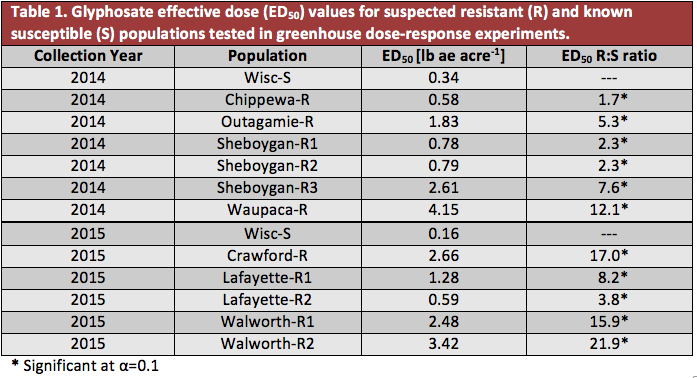 Dose-response experiments confirmed glyphosate resistance in waterhemp populations from Chippewa, Crawford, Lafayette, Outagamie, Sheboygan, Walworth, and Waupaca counties (Table 1). The majority of plants across these populations survived the 1x rate of glyphosate (0.77 lb ae acre-1) and grew to approximately three times their height 28 days after treatment compared to their height at the time of treatment (see Figure 1 for responses of populations from Crawford and Walworth counties). Dose-response curves (examples shown in Figures 2 and 3) allowed us to estimate ED50 values (Table 1) for each suspected resistant population for comparison to a known susceptible population (Wisc-S). Results from testing at the University of Illinois Plant Clinic confirmed glyphosate resistance in waterhemp populations from Brown, Jackson, Jefferson, Monroe, Pepin, Richland, and Sauk Counties. 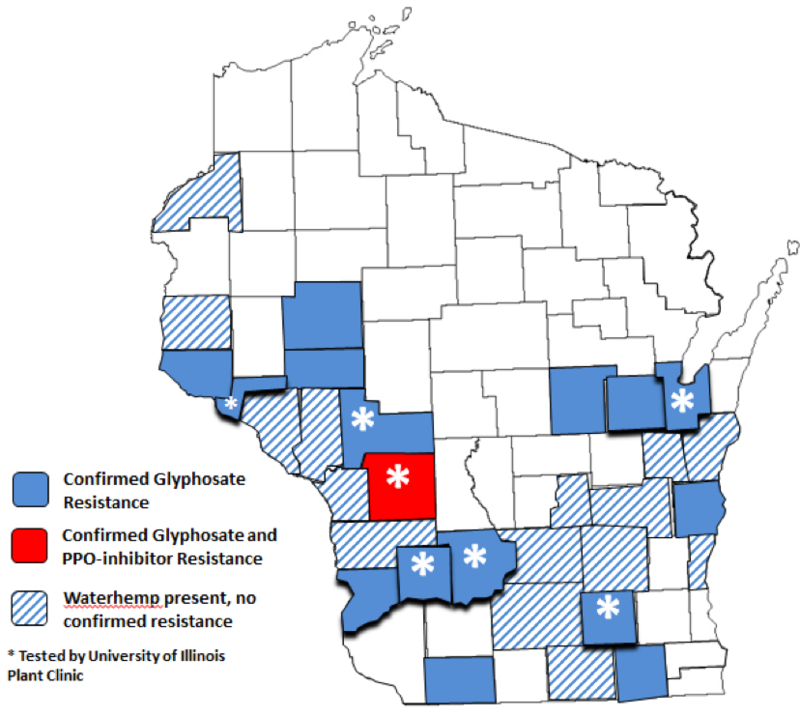 The population from Monroe County was also found to be resistant to PPO-inhibiting herbicides making it the first confirmed case of multiple resistance to these two herbicide SOAs in Wisconsin. In total, herbicide resistant waterhemp populations have been confirmed in 16 Wisconsin counties since 2013 (Figure 4). Figure 1. Common waterhemp plants from susceptible, Crawford County, and Walworth County populations 28 days after treatment with glyphosate at 0.77 lb ae acre-1. Figure 2. 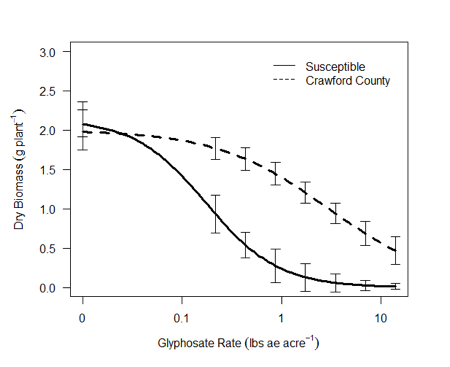 Glyphosate dose-response curves for Crawford County and known susceptible common waterhemp populations 28 days after treatment. Figure 3. 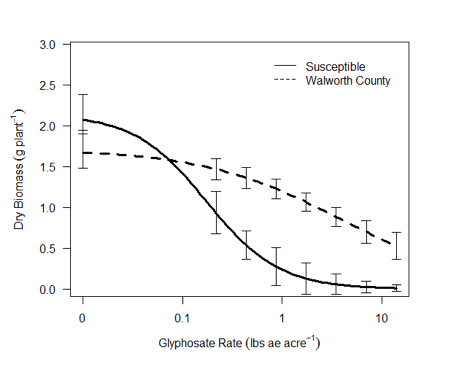 Glyphosate dose-response curves for Walworth County and known susceptible common waterhemp populations 28 days after treatment. Figure 4. Common waterhemp reported distribution and herbicide resistance in Wisconsin. Managing herbicide-resistant weeds moving forward. It is important to utilize diverse strategies when combating herbicide-resistant weeds. 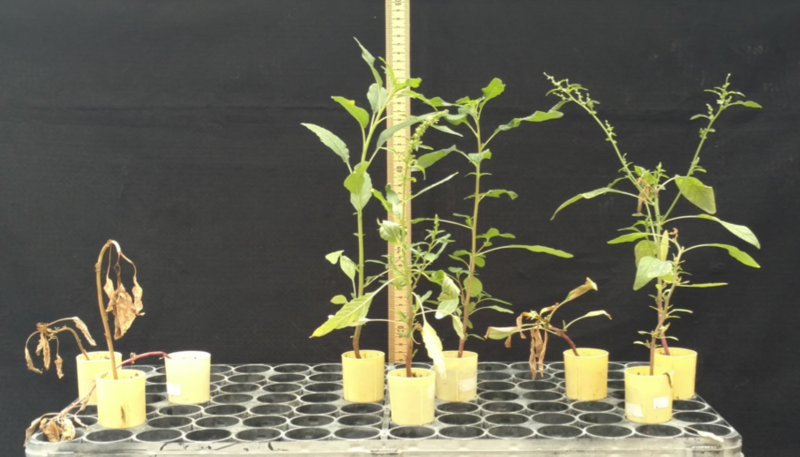 Tank-mixing multiple, effective herbicide SOAs has been shown to reduce selection for herbicide resistance in common waterhemp than simply rotating SOAs year to year (Evans et al. 2015). It is also crucial to make the most of the critical weed-free period during crop growth, so early planting when possible in conjunction with pre-emergence herbicides will allow for canopy closure with minimal weed interference. This also reduces selection pressure on weed populations in the field that are exposed to herbicides applied postemergence (POST). Make sure to apply the full labeled herbicide rates at recommended weed sizes and scout fields following POST herbicide applications to determine herbicide efficacy. Any weed escapes can then be removed by hand. It should also be noted that ALS-inhibiting herbicides are not recommended for sole management of common waterhemp. While ALS-inhibiting herbicides can offer effective management of certain weed species, it has been well-documented that resistance to that class of herbicides has become the norm in pigweed species (Tranel et al. 2011). If you suspect that herbicide resistance is an issue in your fields, contact your local county extension agent. The authors thank Vince Davis, Tommy Butts, and Ross Recker for previous contributions to this research.